Stay hydrated with these imprinted water bottles! Each bottle features a colourful lid with a colour matching string. Keep track of your beverage levels by peering through the clear body. The bottom detaches to reveal a small compartment area—great for holding ice to keep your beverage nice and cold! 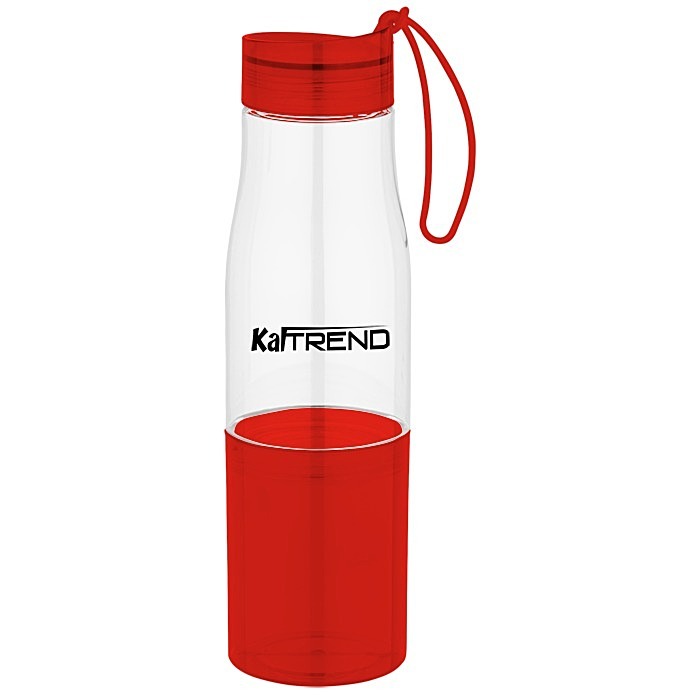 This unique, ultra-modern sport bottle is an impressive giveaway for any business. Constructed with a durable, BPA-free Tritan plastic. Tritan #7 and can be recycled in only a few limited areas; check locally for more information. Size: holds 473 mL (16 ounces). Your price includes a one colour imprint on front of sports bottle. Imprint size: 38 x 63 mm (1-1/2" x 2-1/2").